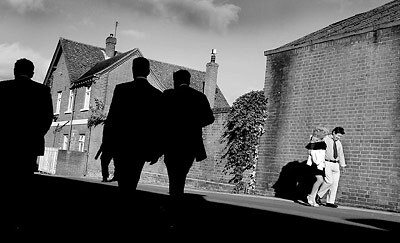 "END OF THE DAY" A drunk couple make their way home at the end of the day after attending the Royal Ascot races. Royal Ascot is the world's most famous race meeting, steeped in history that dates back to 1711. Ascot is one of the highlights of the British social calendar where the idea of 'class' still prevails. Royalty mix with the rich and famous in the Royal Enclosure which was originally established to provide the Royal Family and their selected guests with privacy, security and exclusivity, allowing them to enjoy their day in comfort and style. While the 'well-to-do' politely sip champagne in their segregated area, the commoners generally get very drunk in theirs.